The Jordan CMFT lines of the Jordan Brand received a lot of good reviews during the release of the earlier editions. This June, Jordan Brand is expected to live up to the expectations once again with release of a new colourway of the Jordan CMFT Viz Air 13 LTR. Part of the Jordan CMFT Viz Air 13 family, but is tagged with the LTR label because of the quilter leather panels; this shoe will come out in White/White-Black colourway, simple but is very appealing. 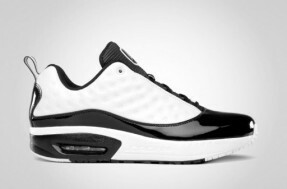 It is made up of white leather upper and black accents on the mudguard, midsole, tongue, and also the outsole. Hitting the market at a very affordable and reasonable price, there is no reason to miss this release from Jordan Brand this June 2011! Three New Jordan CMFT Viz Air 13 Coming Out this June!